Grilled kipper with runny egg is a great combination but a fiddly one with all those bones. This is an elegant solution, suitable for a light lunch or elegant, dinner-party starter and can be prepared well in advance. Preheat the grill to medium. Place the kippers skin-side up in an ovenproof dish and put a couple of knobs of butter on each one. Put the kippers under the grill for 10 minutes, basting them occasionally with the butter. Take out, remove the head, peel off the skin and lift off the bones, taking care to pull away any that remain attached to the fillets. Put the fillets in a food processor and blend. Add the lemon juice, breadcrumbs and the remaining butter and blend until you have a coarse pâté. Refrigerate for at least 2 hours. Bring a saucepan of salted water to the boil and add the eggs. Simmer gently for exactly 7 minutes, lift out, tap them to break the shell and drop into a bowl of iced water. Carefully peel the eggs. Toss the watercress in the vinaigrette and place a mound of salad on each plate. 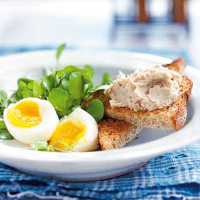 Serve a spoonful of the pâté with a halved egg and some brown toast.